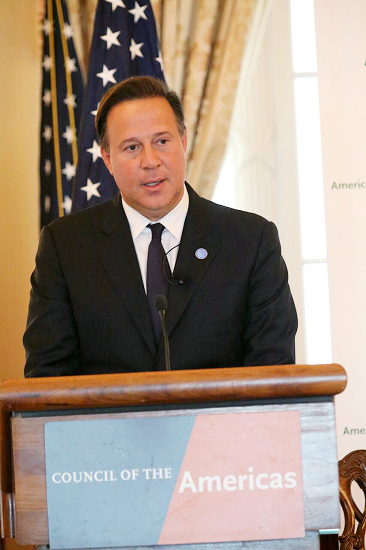 After a stop in Washington, Varela spoke in New York to the Council of the Americas. Photo by the Presidencia. As with Alice in Wonderland, things are getting curiouser and curioser as President Juan Carlos Varela continues to mismanage the Suddeutsche Zeitung crisis. Yesterday was World Press Freedom Day. It was also the starting date for the Council of the Americas conference in New York City, where President Juan Carlos Varela was the ranking speaker of that Rockefeller Foundation-sponsored event. Undoubtedly it was part of a misguided damage control strategy to limit the risk to Panama’s reputation. But he may well be adding fuel to the fire, just days ahead of the second dump of Panama Papers on May 9th. In deepest background, the president has painted himself into a corner, as the result of a media policy aimed at suppressing journalists with significant audiences. On Varela’s third day in office, Dr. Miguel Antonio Bernal was inexplicably relieved of his 40-year-old radio spot, and, in quick succession, so were professors Julio Miller and Candelario Santana. With the field thus cleared for the media establishment which virtually elected Mr. Varela in 2014, press coverage had been benign, if not biased. Thus bereft of any constructive criticism on the media lynching of former officials, Mr. Varela has kept busy painting himself into corners. Not one single Varela appointee to the prior government he initially shared with Ricardo Martinelli for 26 months was among them. But wIth his press barons now running for cover following the initial Suddeutsche blitz, he has effectively been left out in the cold, garnering the worst approval ratings in Panamanian history (at barely two years into a five-year term). Particularly on transparency — a linchpin of his election platform — on which his strongest suit against the former Martinelli government was predicated. But this also marks new blow to his legacy. In its first two years Varela’s Panameñista Party bent over backwards (literally) to award lucrative contracts to the Brazilian Odebrecht (of Lava Jato fame), which has proven proficient in winning public works projects in Panama since President Ricardo Martinelli and Mr. Varela (then his vice president) flew down to Rio together in 2009 — and returned with a new executive jet for presidential travel. Most memorable are their jaunts with then Italian Prime Minister Silvio Berlusconi. Excluding prequalification restrictions makes for “legal” self-serving measures. Prior to a Washington stopover en route to his NY Rockefeller conference, the president indicated he will not veto the bill — notwithstanding public opinion that it should have precluded contractors convicted elsewhere from bidding in Panama. This in hopes of forestalling any criticism of the earlier awards to Odebrecht during Mr. Varela’s watch. That the president’s own brother José Luís Varela (who heads their party’s legislative caucus) had personally defended this specific omission in the bill highlights a family sensitivity to this particular point. But this quickie may well carry unintended consequences: evidencing a growing lack of legitimacy to govern. Should the upcoming Suddeutsche documents involve the Varela family, Panama could well be governed by its second woman president.